Happy holidays! I hope that everyone has had a lovely holiday season. Work got a little crazy the weekend before Christmas, and then my mom and my sister came into town to spend the holidays with me. Most of my shopping this month actually came from online Black Friday sales. With this month's clothing expenditures, I've spent $2729 for the year, which at least puts me slightly under the $3000 absolute upper limit I set for myself. In the next few weeks, I plan to write up some reflections on my shopping habits this year: best and worst purchases, plans for next year, and a few other thoughts. This month, I also tried on a few other things that didn't work. This Uniqlo x Lemaire wool and cashmere sweater with a knit-in square pattern was lovely and soft, but ran strangely large for a Uniqlo sweater which, when combined with the dolman-ish sleeve, just wasn't flattering. I also bought these Frye Erin lace-up boots from Hautelook on a whim, in hopes of replacing a well-loved pair of boots that I wore out early this year. While the leather was nice and soft, and I thought the boots were great quality, they were a little too narrow. My usual size was right on the edge of being too small and the next size up was definitely too big. White + Warren Cashmere Open Knit Cardigan - $53.40* - I bought this on Gilt during a fairly substantial additional percent off Black Friday promotion. I didn't realize that White + Warren sweaters run large, so the size M I bought has an oversized, boyfriend sweater look on me. I don't mind that too much, and the oatmeal color works well to add a tiny bit of variety to my mostly black and navy work wardrobe. Uniqlo Cashmere Crew Neck Cardigan - $49.90 - I also purchased this during a Black Friday sale. Uniqlo's cashmere sweaters are a good value when they're on sale, though I have sometimes balked at paying full price for them. This sweater also runs a bit larger/more true to size for a mall brand than I expected based on the size chart and some of the Uniqlo merino wool cardigans I've tried, so the M I got is also a little big. This is also primarily for my work wardrobe. Sam Edelman Sara Leopard Flat - $55.24 - This was my last Black Friday sale purchase from 6PM. 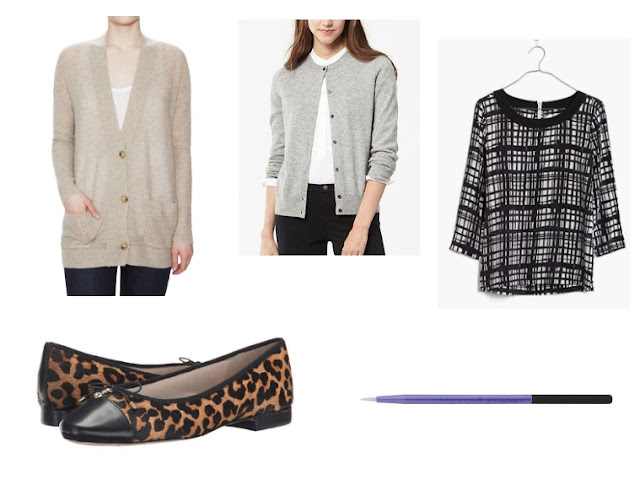 It ends up filling one of my "Five-Piece French Wardrobe" slots as an alternative to the leopard print slip-on sneakers I initially wanted, but are less suitable for my new lifestyle as an office-dweller. Madewell Silk Retrospect Top, Brushstroke Plaid - $35.99 - This was one of my only in-person purchases in the latter half of the year. It was an impulse purchase, though I find casual-leaning silk tees like this (I also have one from Uniqlo from several years back) to be versatile because they work in both my work and casual outfits. Real Techniques Silicone Liner Brush - $4.19 - Pret a Porter P recommended Real Techniques brushes in a comment, and I decided to add this to a recent drugstore.com order when I was stocking up on household items. I previously used this Sephora eyeliner brush, but wasn't satisfied because it was difficult to clean and the bristles sometimes felt stiff and uncomfortable to use. The Real Techniques silicone brush is great, though it took two to three uses before I really started getting the hang of it. I get a significantly finer line than with the Sephora brush, and it is also easier to clean due to the lack of bristles. I think it also wastes less product because less excess product gets caught on it. *Indicates that listed price includes shipping fees, sales tax, or both. Linking up with Franish and the Budgeting Bloggers again this month! Be sure to check out what everyone else bought.